Visitors to Halvorson say it's the gateway to paradise. They're not wrong, mind you - from the province's warm, sunny weather to its idyllic beaches, coves, and forests, Halvorson truly is Sirocco's most beautiful province. The capital, Otanaki, is the country's holiday city. Nestled snugly at the feet of the Halvorson Ranges and beside the tranquil Otanaki Forest, the city's quiet rustic charm will envelop you. With plenty of open spaces and without the rush of life in bigger cities like Alston and Havilland, the quality of living in the capital is without par. Just a stone's throw from the Great Halvorson Beach, at nights you can hear the waves crashing on the beach, wiping the slate clean for the next day. In fact, Halvorson is a province of beaches. While the Great Halvorson Beach is the largest and most-frequented, it is one of many. To the west is Lantern Bay and Elizabeth Beach, while to the east are a string of hidden beaches and bays that lead to the legendary Stony Bay. And just like their flagship counterpart, the surf is excellent. To the south lies the Shire of South Halvorson, a long, thin province that follows the Whananaki River through the forests inland from Commercial Bay, before turning north to the farming settlement of Sinclair Flat. The A25 and Highway 31 make for relatively easy walking, although a sturdy pair of shoes never go amiss. But if forest walks aren't your thing, there's always the famed Whananaki footbridge (Highway 32), the longest footbridge in the Southern Hemisphere, and an excellent spot to go fishing in the rich waters below. And for you golfers, Otanaki boasts the Halvorson Golf Course, northern Sirocco's largest golf course, spread across more than half of the urban area. Rounds are cheap and all equipment is supplied, but you've got to bring the skill! Tee off near The Chathams across Long Grass Gully and see if you can sink a hole-in-one where the grass ends and the beach sand begins. From the second tee at Beachside, swing carefully towards the third hole, else you'll lose your ball somewhere in the forest. Finally, make your way home to The Chathams, working your way around the tricky dogleg past the city centre and up the beginning of the Ranges foothills to the third hole. 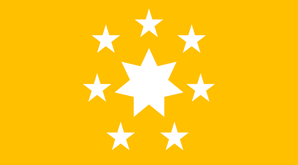 Halvorson's flag uses an orange background to represent the province's numerous beaches, and a circle of stars surrounding a larger central one to represent the myriad of natural features and attractions in the province.